Designed for a dynamic lifestyle, the TYR Women's Harlow Top - Edessa caters to adventurists both in and out of the water. Whether it's a morning workout or a paddleboarding excursion, the BHED7A is inspired by women who aren't afraid to sweat it out. 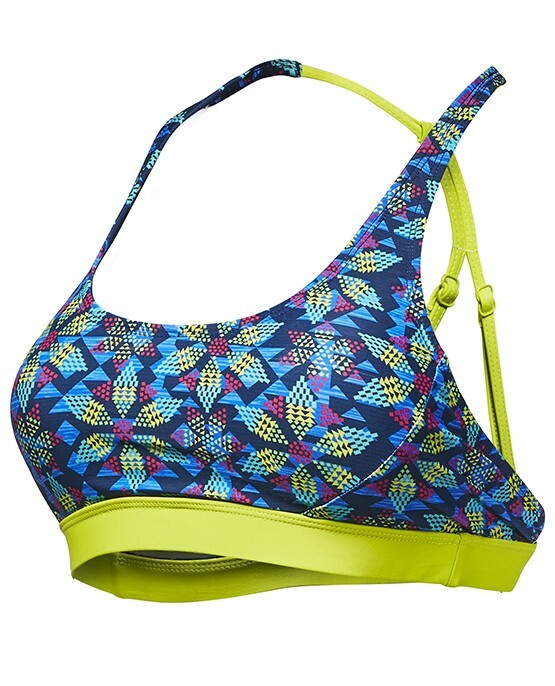 Featuring a vibrant print and removable cups, this fully lined bikini top halters at the nape of the neck with adjustable straps that create a triangle at the back. Created with UPF 50+ technology, the BHED7A ensures sun safety for every outdoor activity. TYR Women's Harlow Top - Edessa is exactly what I wanted! The TYR bathing suit top is super comfortable, stylish and what I needed to get me back in the pool and swimming again! Great looking top, but runs in smaller side. I had to return. I wear a 36b bra and will need to return my medium for a large. Tight under arm pits and cut lower than expected at neckline.